Our tap water is nasty. It smells like dirt and sometimes we get a moldy or humid smell. YUCK! We used to buy gallon jugs of water and refill them, but as we grew into our sustainable lifestyle this method was no longer a fit for us. The solution? Alexapure & Berkey gravity filters. Gravity water filtration systems use ceramic filters. Yes these filters are expensive but you can wash them and you don’t need to change them often. Each filter is guaranteed to produce 5,000 gallons of water. So typically you won’t need to change filters for around 2 years. 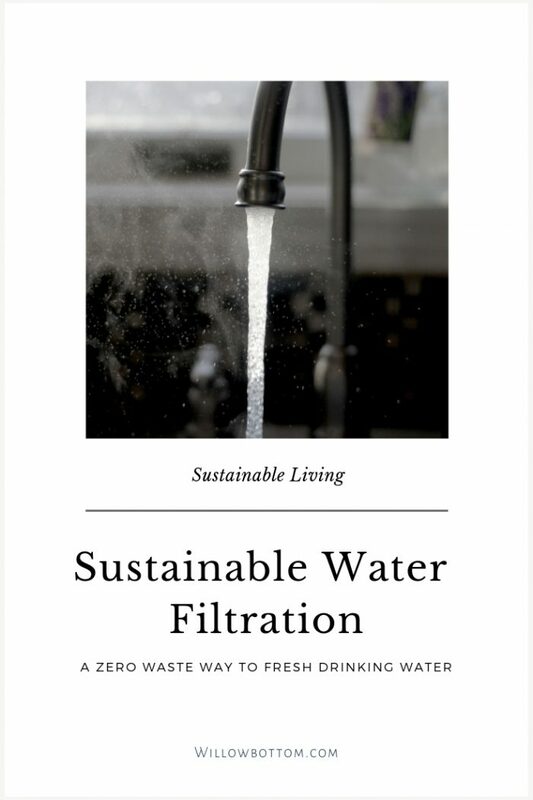 There is capacity for 4 filters in the tank, but you don’t need to use 4 to get clean water. We only use one filter. What’s great about these systems is, you can add water from any source (rain, river, pool) and it makes it potable. We use the Alexapure filter system. We chose it over a reverse osmosis system because water treated with reverse osmosis is dead water. Dead water is what it sounds like, water that has been stripped of all essential minerals. Yes the water won’t have chemicals, fluoride or other impurities in it, but it’s not doing your body any good. Dead water has been linked to motor neuronal disease and cancers. This is the same with distilled water. These gravity filtration systems don’t produce dead water. They filter out all the bad and leave in the good minerals our bodies need. We store our filtered water in these glass jugs so that we always have fresh water to drink, and we take a gallon to work with us since the office we work in uses reverse osmosis for the drinking water. 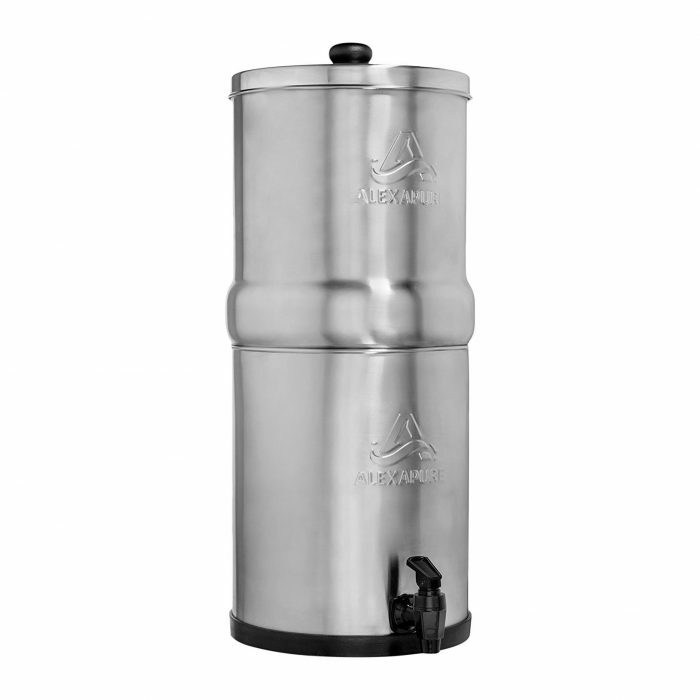 These gravity filters make a great addition to any sustainable and zero waste lifestyle. Wow! This is super helpful. I have been thinking about this too, but we haven’t gotten there yet. I’m glad you found this helpful. It’s so worth it in the long run! Oh wow, I’ve never heard of this!! I love that it needs to be replaced less often, thus creating less waste. I’m sure that’s worth the investment! It is! We have had ours for little over 2 years now and have only changed the filter once! Wow, I have never heard of dead water and always wondered why you shouldn’t drink distilled. These systems sound great for places with a less than ideal tap water supply. This is great. I often overlook the issue of ‘dead water’. thanks for the reminder. Dead water is not well known. I didn’t know what it was until I did some research after being sick from drinking reverse osmosis. It’s scary to think that it’s so harmful! This is so interesting! I’ve thought a lot about water reduction lately but I haven’t seen this idea before.